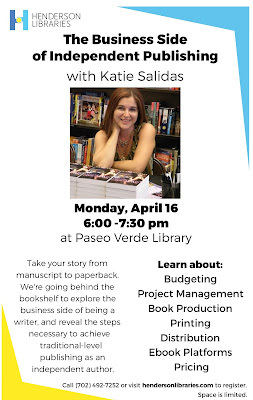 Katie Salidas: Are you Ready to Learn The Business Side of Independent Publishing? Are you Ready to Learn The Business Side of Independent Publishing? Register Free and Secure Your Seat! Go behind the bookshelf to explore the business side of being a writer as I reveal the steps necessary to achieve traditional-level publishing as an independent author.